NEW YORK TIMES BESTSELLER - Soon to be a Hulu original series starring Chris Pine. Larry Tye appears on CNN's American Dynasties: The Kennedys. 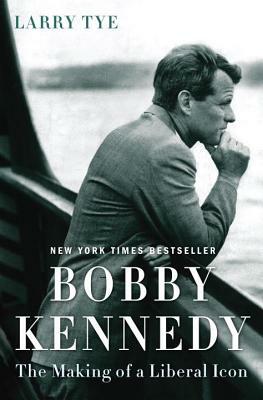 Bare-knuckle operative, cynical White House insider, romantic visionary--Robert F. Kennedy was all of these things at one time or another, and each of these aspects of his personality emerges in the pages of this powerful and perceptive biography. History remembers RFK as a racial healer, a tribune for the poor, and the last progressive knight of a bygone era of American politics. But Kennedy's enshrinement in the liberal pantheon was actually the final stage of a journey that began with his service as counsel to the red-baiting senator Joseph McCarthy. In Bobby Kennedy, Larry Tye peels away layers of myth and misconception to capture the full arc of his subject's life. Tye draws on unpublished memoirs, unreleased government files, and fifty-eight boxes of papers that had been under lock and key for forty years. He conducted hundreds of interviews with RFK intimates, many of whom have never spoken publicly, including Bobby's widow, Ethel, and his sister, Jean. Tye's determination to sift through the tangle of often contradictory opinions means that Bobby Kennedy will stand as the definitive biography about the most complex and controversial member of the Kennedy family. Larry Tye has been an award-winning journalist at The Boston Globe and a Nieman Fellow at Harvard University. He now runs a Boston-based training program for medical journalists. He is the author of the New York Times bestseller Satchel, as well as Superman, The Father of Spin, Home Lands, and Rising from the Rails, and co-author, with Kitty Dukakis, of Shock. He lives in Massachusetts.